16 1/4" X 17 1/2"
This work is an investigation of an anonymous memorial. My subject is a police sketch of unidentified remains found near Salem, Oregon in 1980, which I researched through a national registry. My design is made using computer generated graphics relating to grieving from social networking. 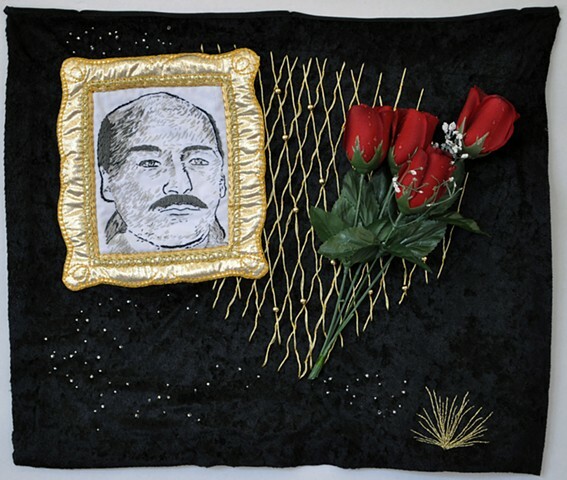 By translating this kitsch memorial into embroidery and applique, I attempt to broach the anonymity through devotional craft.